This is one post where I’m not going to pretend to have the answers. Not that I would pretend. Not usually. Rather, I’m going to be asking a lot of questions. Let’s start with this one: Do you watch Miss Fisher’s Murder Mysteries? It’s a remarkable show set in Melbourne, Australia in the roaring ’20’s. Phryne Fisher is something of an oddity in her 1920’s setting, being a beautiful, wealthy, independent woman who’s intelligent and driven. Not to mention fearless. Fisher is not one to hide behind the coattails of a man, as she’s rather adept at hand-to-hand combat and carries a pistol in her handbag. She is, in addition, forthright and flirtatious, and enjoys brief flings with attractive, muscular men. Perhaps the most remarkable thing about Miss Fisher is the actor who plays the titular character. Essie Davis conveys volumes with her posture, gait, eyes, voice, and phrasing. And now comes the big question: How would you capture that in writing? Is it even possible to capture in writing some of what is conveyed in moments in visual media, or must we simply concede that visual and written media are different, each with their own strengths and weaknesses? Of course, the logical thing to do would be to read one or more of Kerry Greenwood’s Phryne Fisher books to see how she did it. Succumbing to the inevitable, I downloaded an e-version of Cocaine Blues to my tablet. Say what you will about e-books, when it comes to instant gratification, you can’t beat them. At any rate, Greenwood makes no mention of what Fisher does with her eyes. Nor voice. Nor posture. Her personality is well captured in other ways, though. In one notable scene, a constable expresses to Chief Inspector Jack Robinson that they could arrest Fisher and take her down to the station. Wearing only a lounging robe, Fisher steps out of the robe and, completely naked, tells the inspector that if she is to be taken to the station, it will be like this. Classic. But suppose you wish to capture the subtleties of Davis’ performance in writing? Consider the scene in the pilot episode where Fisher first meets Inspector Jack Robinson. The scene takes place in a bathroom where a man was found dead. A chalk outline is all that remains of the victim. Fisher has wheedled her way past Constable Hugh Collins to have a look for herself. A knock on the bathroom door shortly after, and Fisher admits Collins and his superior, Inspector Jack Robinson. This is what the characters said, but by itself, this doesn’t at all reflect what actually passes between the characters. Let’s add some annotations. Up until now, Fisher has been lecturing on her findings with the tone of an expert speaking to her pupils. Then, in the blink of an eye, she completely changes gears. Well, that captures the feel of the scene a bit better, but you can’t leave it like that. Since most of the unspoken communication comes from Fisher, perhaps it would would be best to describe the scene from Inspector Robinson’s point of view. Robinson kept his face even. He’d learned that it was best to let witnesses and suspects talk when they were inclined to talk, and to pay close attention. There was always time for questions and clarifications after they’d said their piece. Still, this woman was something different. Clearly intelligent and surprisingly, perhaps refreshingly, direct. He found that he was becoming genuinely interested in what she had to say. With some bemusement, he realized that she had taken on the tone and body language of an instructor lecturing to her student. “All wild surmise of course,” Fisher concluded. At this, Robinson noted, Fisher’s voice and posture changed completely. Moving closer and adjusting her hair, she proceeded to purr her words, her eyes large and liquid, keeping full eye contact with Robinson. It was with some effort that he kept his face impassive. Surprised by her boldness, Robinson noted how Fisher eyed him up and down, smiled alluringly, then sauntered out of the room, her hips swaying slightly. Without realizing it, Robinson followed her with his eyes, as did Collins. When she was gone, he once again surveyed the crime scene, this time from a fresh perspective. I could live with that as a decent stab at capturing the scene, but still, you have to be careful how much time you spend on things like eye contact and introspection, for you run the risk of boring your readers. In TV and movies, a glance or a change in expression can occur in a second and it can speak volumes. To express the same thing in writing may take, well, volumes. You need to balance pacing and characterization, and this is where beta-readers can help. 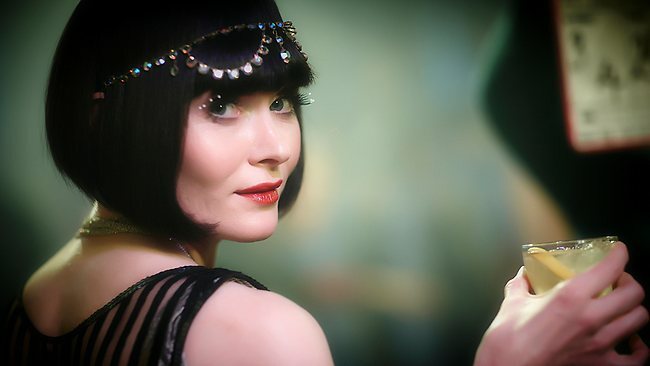 In a similar vein, consider Phryne Fisher’s wardrobe. Fisher sports an amazingly diverse wardrobe and somehow looks good in anything. Her wardrobe nearly becomes another character in the show. But here we come to the same question as before: how do you translate this to the written word? How much space in a short story or even a novel could one sensibly allocate to describing a character’s clothing, and the impact it has on those around her? What vocabulary would you even use? Personally, I’d be at a bit of a loss having to describe in detail 1920’s era women’s fashion. Questions, questions. But this makes for an interesting thought exercise, and hopefully gives us pause to consider adding some more subtleties to the way in which our characters interact.